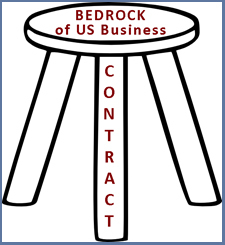 One the three legs of the stool that is the bedrock of doing business is the “contract.” A contract is a legally binding agreement between two or more parties and carries with it the full enforcement of the law when it has been correctly drafted and executed. When one party fails to hold up its end of an agreement, it can be extremely damaging to the other party’s business plans and endeavors. If your or your company needs legal representation with a Breach of Contract case, Orange County Litigation Lawyer, Debra Grimaila will provide you assertive counsel. A “Breach of Contract” means failing to perform any term of a contract without a legitimate legal excuse. The contract may be either written or oral. A breach may include failure to make payment in full or on time, not finishing a job, failure to deliver all the goods, substituting inferior or markedly different goods, among others. A “Breach of contract” in legal terms amounts to a broken promise to do or not do a required or agreed-to act. Breaches of a contract are single, occurring at a single point in time, or continuing breaches. The successful litigation of a case involving a breach of contract requires that you retain an experienced lawyer who can develop a winning trial strategy based on the facts of your situation and California contract law. The early development of an effective trial strategy will often result in a quick and private settlement without the necessity and expense of going to trial. By consulting with Attorney Debra Grimaila early on in a Breach of Contract matter, she can often help you resolve the matter quickly and efficiently, without the stress, and expense of protracted litigation. That said, attorney Grimaila will always be prepared to defend your interests in court when necessary. Your best interests are our priority at all times. Our primary goal is to provide you the highest level of cost effective legal services. Call and speak directly with attorney Debra Grimaila now at (844) 921-1937 When you call Orange County Business Lawyer, P.C., you will speak with Ms. Grimaila who will discuss your legal issues and help you evaluate what course of action to take. Our goal is to provide cost effective legal solutions for all of your business and real estate legal needs.